Every event is special. Whether it’s a corporate fundraiser or a wedding or a special birthday. Let’s make your event a success with custom Save–the-Date cards equally as one of a kind! 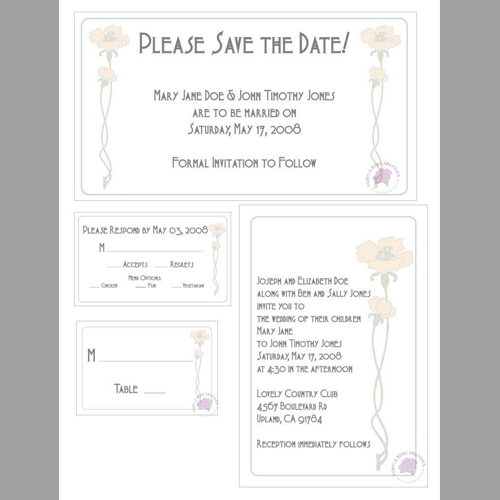 Save the Date Cards are placeholders for party guests. It informs them that there is a special event coming soon. Now guests have a chance to make the necessary arrangements in order to attend the upcoming event. These handy informational cards also set the theme and tone for your event. They can match your event invitation exactly or they can use similar elements as the invitation. Tell me about your event: Does it have a theme or a special honoree? Once I know all of the details about your event, I can create a custom Save-the-Date Card that can get your guests anticipating your special day. I’ve drawn custom clip art pieces for events when I couldn’t find the artwork that my client wanted. This is the first detail in your journey to an amazing event. I’m excited to meet you! Contact me today!